Charles Sylvestre enjoyed a superb second day at the WSOPC Lac-Leamy Main Event, finishing Day 2 with more than double the chip stack of his closest opponent. Day 2 of the WSOPC Lac-Leamy Main Event resumed with 185 players from the combined opening flights, and a further 38 late registrations/late re-entries – bring the total number of entries for the $1,675 buy-in event up to an impressive 371. With more late registrations than were anticipated, the prize pool for the tournament swelled to $556,500 – with the top 45 players cashing, and the winner taking home $122,435. Current favourite to collect the first prize and Champion´s Ring is Charles Sylvestre, who enjoyed a superb Day 2 of the WSOPC Lac-Leamy Main Event and bagged up 1,227,000 chips at the end of a thirteen 40/60-minute levels. Sylvestre is a mile ahead of his closest rivals – Mike Leah (608,000 chips) and Daniel Charette (599,000 chips) – and has three times the average chip stack with just eighteen players remaining in the event. Day 2 of the WSOPC Lac-Leamy started with a number of big names leaving the tournament – including three times WSOP Circuit winner Sam Panzica (who re-entered and bust again), EPL Champion Mike “Timex” McDonald (who re-entered and bust again) and Marc-Andre Ladouceur, who bust AK < JJ the level after late registrations had closed and could not re-enter. After three levels of play, more than fifty players had left the tournament and the chip lead was swinging back and forth. John Nelson jumped into the chip lead when his 9♥ 9♠ flopped a set to bust Mike McDonald (the first time), but Charles Sylvestre was hot on his heels and took over at the top of the leaderboard when busting out fellow WSOP bracelet winner Erik Cajelais A♣ 8♣ > Q♥ J♥. Jean-Louis Lecuyer then became the first player to break the 200,000 chip barrier when catching a King on the Turn to best DJ MacKinnon´s pocket Eights, but his reign at the top of the chip stacks was short-lived after Marc Carpentier had hit a runner-runner straight to bust an opponent 9♣ 8♦ > K♦ Q♣. Carpentier was joined at the top of the leaderboard by Bryan Moon after Moon had bluffed Nicola Basile out of a 66,000 chip pot but, with the bubble approaching, the dynamics of the game were about to change. Going into Level 16 (blinds 1,500/3,000 – ante 500), the length of the levels increased to 60 minutes and just 74 players remained. Mike Leah moved into contention when he bust out Patrick St-Michel 9♥ 9♦ > A♦ K♥ and Vladimir Faubert found A♦ A♥ at a crucial time to double up against his opponent´s pocket Jacks. Charles Sylvestre eliminated an opponent 9♠ 7♣ > A♥ K♥} after the flop of J♥ J♦ 7♥ and the field was reduced to just 52 by the dinner break after Hugo Dumoulin bust two players in the same hand Q♥ Q♣ > 10♥ 10♣ > 7♣ 8♣. Daniel Charette had moved into the chip lead by using a growing chip stack to bully players out of valuable pots, and he eliminated a player in 46th place 5♠ 5♦ > A♠ K♠ to burst the bubble and increase his chip advantage in the WSOPC Lac-Leamy Main Event. He was the first player to breach the ½ million chip barrier when busting out Gaetano Buda 7♦ 7♠ > K♣ J♥ and finished the night on 599,000 chips. Other players to benefit during the post-bubble dash for the exits included Bryan Moon – who busted both Nicola Basile and Camille Mikhael in the same hand when his 9♠ 9♣ flopped a Full House – and Tony Della Sciucca – who came from behind with A♣ 10♥ against Francois Toutloff´s A♥ J♠ to eliminated Toutloff in thirty-fourth place. Charles Sylvestre took the chip lead in the WSOPC Lac-Leamy Main Event courtesy of a knock-out when just 28 players remained. His opponent moved all-in pre-flop with K♥ 10♠ and Sylvestre´s A♣ 10♣ held on a Queen-high board. He then won a massive pot against Remi Ltaif, when his Q♣ 8♣ flopped a set and improved to Quads on the Turn to best Ltaif´s A♦ 10♥ (who turned a Full House) and finished the night by busting out Renmai Liu A♠ Q♣ > 3♦ 3♣. When play resumes later today in the WSOPC Lac-Leamy Main Event, Charles Sylvestre will have double the chips of his closest rival, with blinds of 6,000/12,000 and an ante of 2,000 chips. 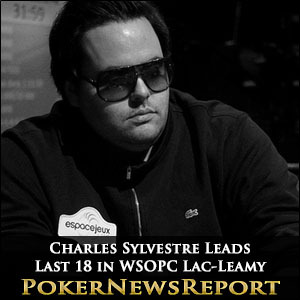 Play is expected to continue until just six players remain, but with Charles Sylvestre being in such hot form, that could result in a very short day!